I was rummaging through my magic box of unused products and was looking for an alternative to the Skinfood Teatree foaming wash. And voila this popped out. 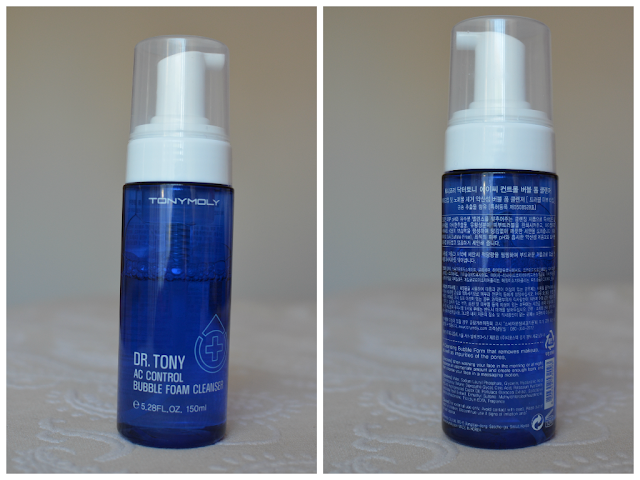 The Tony Moly Dr. AC Control Bubble Cleansing Foam. In Korean products, "AC" means acne, I have no idea why. So any product marketed with this label is aimed at "troubled" skin aka acne prone skin. As you can see I have used quite a bit of the bottle. Don't know if it's because it dispenses a lot of product or I'm just really liking it. 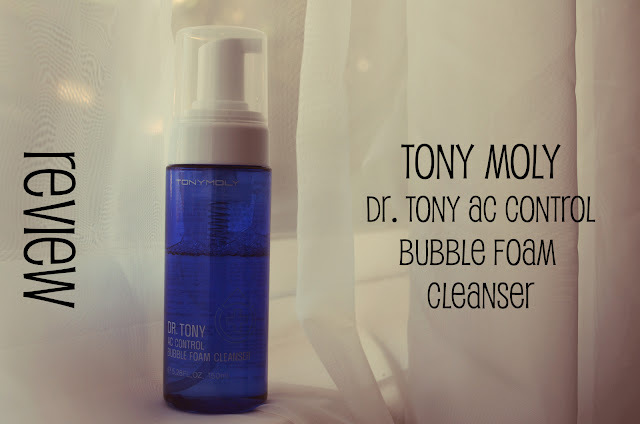 A Cleansing Bubble Form that removes makeup, as well as impurities of the pores. The pump mechanism is pretty cool. You can even see it through the bottle. Ok I'm a nerd, I get it. Despite this being a korean product, it is great that they included English instructions and ingredients down the bottom. But looking at the ingredients, there was nothing that stood out as the active anti-acne ingredient is. All I see are foaming boosters. So off to google I went. I am usually very skeptical when it comes to natural remedies. Especially since these are listed so low down on the list, they probably don't make up a large portion of the cleanser any way. The foam is actually quite stable when you dispense it. Even when I spread it, the bubbles still stay strong. I have been really into foam washes lately because they are so easy to use and minimises how much you tug on your skin. I can get a little rough with my face when cleansing. As you can see, this lathers very well. The more you rub this in the whiter and foamier it gets. It's hard to describe the scent of this. "Clean" is the only word I can think of, but very pleasant to use. This was a surprisingly gentle cleanser but I would definitely not recommend this for any one with super dry skin. Mine is pretty normal now so this worked quite well. My skin feels very clean afterwards and a smidge tight. In terms of “removing makeup...and impurities of the pores” the cleanser probably is not strong enough for that. But that’s not what I use a cleanser for anyway. A dedicated makeup remover is a must. This does what I expect of a cleanser, that is to cleanse my face. I haven’t noticed a noticeable change in my pores but there is less congestion overall. After using this for 2 months my face feels very smooth. It might be the combination with my other products but a high school friend was amazed how clean my skin looked despite wearing no makeup. That’s always a bonus. But it has kept monthly breakouts at bay. I’d like to think I am growing out of them so I can’t say how this would work on full acne skin. This has been a great cleanser which does not quite fulfill its promises but it really did keep my skin clear. Definitely recommended if you have normal to combination/oily skin and you have quite mild breakouts.